Andre a enfin vendu pour 20 millions de $ sa maison de Tiburon, qu'il utilisait très peu . Soit 3 millions de $ de moins que son prix d'achat en 2001. La vente finale devrait s'effectuée début janvier. L'acheteur n'est autre que Stuart Peterson, l'un des fondateurs de Youtube, récemment racheté par Google. Andre dans les années 1990 avait déjà remarqué cette maison construite en 1976 . Mais pas longtemps après Andre s'est marié avec Brooke Shields qui n'aimait pas cette maison et l'a donc dissuadé de l'acheter. C'est donc à cette époque qu'elle vu vendu à John E. McCaw Jr .
Andre regrettera pendant longtemps de n'avoir pas acheté cette maison . Lorsque celle-ci fut de nouveau en vente, Andre n'hésita pas une seconde, ne voulant même pas négocier , et acheta la maison. Il ne voulait pas de nouveau la rater. Andre à l'époque se rendait souvent là bas, car Brad Gilbert habitait pas loin. Depuis sa retraite vit dans sa maison de Las Vegas. It took almost four years, but retired tennis stars Andre Agassi and Steffi Graf finally have found a buyer for their Tiburon, Calif. estate for $20 million, or about $3 million less than what they paid for it in 2001. The deal is expected to close the first week in January, according to Bill Bullock, whose firm Decker Bullock represents Agassi and Graf. The 3 1/2-acre site - complete with a 10,500 square-foot main house, a 2,500 square-foot staff quarters, two swimming pools, a stream and, of course, a tennis court - boasts views of the Golden Gate Bridge and the San Francisco skyline. Stuart Peterson, president of the San Francisco hedge fund Artis Capital Management, is the buyer, according to Bullock. The fund was a major investor in YouTube, the video sharing Web site that Google agreed to buy for $1.65 billion last month. The property was put up for sale because Agassi and his family were using it infrequently and the tennis star's financial advisers wanted him to dispose of it, said Bullock, who along with Lydia Sarkissian represented Agassi in the deal. "When they considered the annual cost of that property to sit there vacant, they decided that they needed a little inducement for the marketplace and they started reducing the price," Bullock said. After initially listing the Agassi property at $24.5 million, the price was reduced several times before Agassi dropped it six months ago to $21 million. The property may pull in a price higher than any other sold in the Bay Area this year, according to McGuire Real Estate, which sells homes in San Francisco, Marin and San Mateo counties. Bill McKeon, who manages McGuire's Marin office and helped sell the Tiburon estate to Agassi in 2001, said the selling price is among the highest in Marin in several years. The Agassi house, built in 1976, underwent its last significant renovation in the mid-1990s by John E. McCaw Jr., the cellular telephone mogul who sold the house to Agassi five years ago. That left the house with a dated feel that made it more difficult to sell, Bullock said. "We had a lot of very wealthy people up there," Bullock said. "There were a few movie stars and some other very substantial people who came to see it, but for whatever reason it just wasn't for them. They didn't understand what was there and what could potentially be there." Agassi was drawn to the property in the mid-1990s, before it was sold to McCaw. 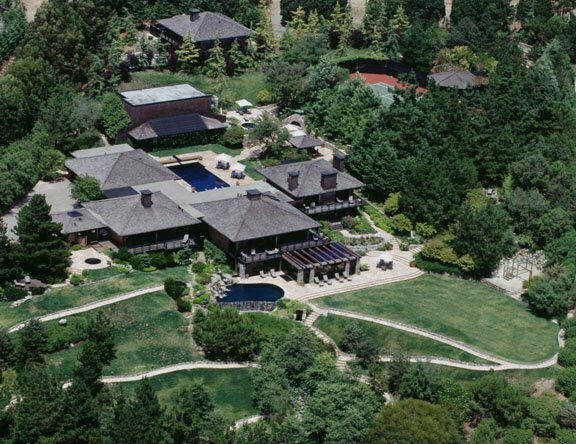 Agassi then was married to actress Brooke Shields, who disliked the Tiburon compound and dissuaded him from purchasing it. "He always regretted that he didn't buy it," Bullock said. "When it came on the market again and Andre found out about it, he didn't negotiate. He just called up and made the deal. He didn't want to lose it again. He didn't want to take the chance." Agassi visited Marin County frequently because his former coach, Brad Gilbert, lived there. Agassi retired from tennis after this year's U.S. Open and now lives in Las Vegas with Graf and their two children.